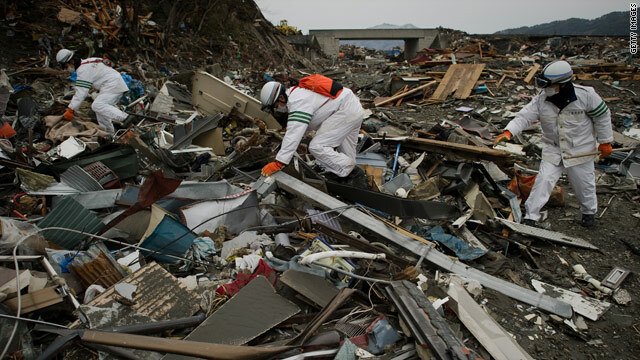 A rescue team looks for bodies among destroyed houses and debris in the tsunami-damaged town of Otsuchi in Iwate prefecture on March 26. A magnitude 9.0 earthquake hit northern Japan on March 11, triggering tsunamis that caused widespread devastation and crippled a nuclear power plant. Are you in an affected area? Send an iReport. Read the full report on the quake's aftermath and check out our interactive explainer on Japan's damaged nuclear reactors. [9:16 a.m. ET Sunday, 10:17 p.m. Sunday in Tokyo] Tokyo Electric says it is re-checking its results for a form of radioactive iodine in water from the No. 2 reactor's turbine building at Fukushima Daiichi after Japan's nuclear safety agency questioned extremely high figures released earlier Sunday. [1:30 a.m. ET Sunday, 2:30 p.m. Sunday in Tokyo] Radiation levels in pooled water tested in the No. 2 nuclear reactor's turbine building at the Fukushima Daiichi power plant are 10 million times normal, a power company official said Sunday. Japan's nuclear and industrial safety agency reports the surface water showed 1,000 millisieverts of radiation. By comparison, an individual in a developed country is naturally exposed to 3 millisieverts per year, though Japan's health ministry has set a 250 millisievert per year cumulative limit before workers must leave the plant. One person was working in and around the No. 2 reactor when the test result became known, according to an official with the Tokyo Electric Power Company, which runs the plant. That individual subsequently left, and work there has stopped until the government signs off on the power company's plan to address the issue. The process to start removing pooled water from that building had been set for late Sunday morning, Hidehiko Nishiyama, an official with Japan's nuclear safety agency, previously told reporters. [1 a.m. ET Sunday, 2 p.m. Sunday in Tokyo] Radiation levels in pooled water tested in the No. 2 nuclear reactor's turbine building at the Fukushima Daiichi power plant are 10 million times normal, a power company official said Sunday. Japan's nuclear and industrial safety agency reports the surface water showed 1,000 millisieverts of radiation. By comparison, an individual in a developed country is naturally exposed to 3 millisieverts per year, though Japan's health ministry has set a 250 millisievert per year cumulative limit before workers must leave the plant. One person was working in and around the No. 2 reactor when the test result became known, according to an official with the Tokyo Electric Power Company, which runs the plant. That individual subsequently left, and work there has stopped until the government signs off on the power company's plan to address the issue.